About two years ago, I threw together a power box with 4 switched outlets. I had some solid state relays (ssr) from another project that never panned out, so I jammed them onto the sides of a plastic electrical gang box. It worked quite well, but all of the 110V was exposed on the outside. I never bothered to fix it up. The first power switching box. You can see two screws sticking out of the left side. This is where an Arduino would be mounted. The terminal block connected up the 4 circuits, plus one auxiliary SSR, as well as the common ground for all of the SSRs. The four outlets on the left are switched, the two on the right are not, which was perfect for using a power brick for standalone use. The circuit for this is pretty darn simple. On the AC side of things, the grounds are tied together, as are the neutrals (white or blue). This is the taller prong of the outlets. The hot from the mains cord (black or brown) gets split up to one side of each of the 8 SSRs. The other side of the SSR goes to the hot pin of the outlets (shorter prong). 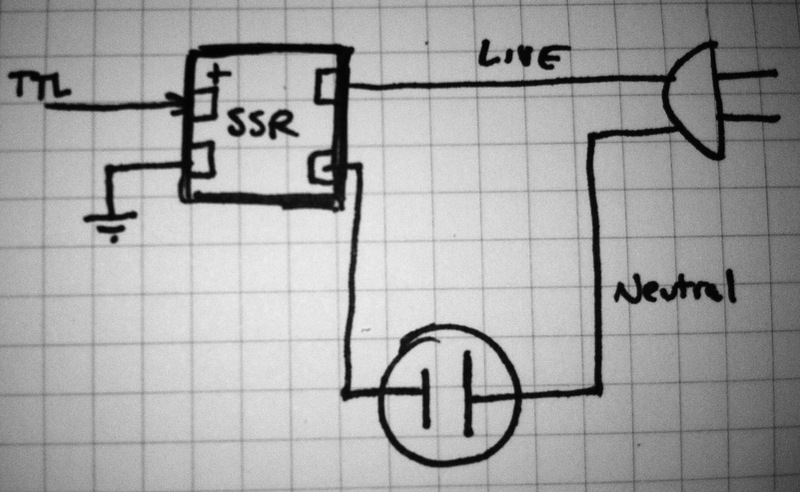 Each SSR also has a low-voltage section. The ones I had were 5v, so I could switch them with TTL inputs. 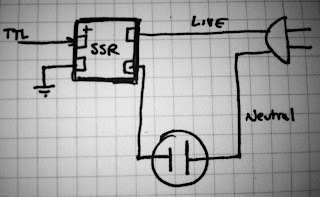 All of the low voltage "+" sides of the SSRs go to the terminal block, to be connected to an Arduino, parallel port, whatever. The other sides are all tied together to the ground screw on the terminal block. You can surely do this cheaper with triacs, cheap relays, etc, but I had these on hand, and decided to just use them. Exposed wiring. Not kid or pet friendly. Also, don't lick it. Black wires are the hot or switched 110V lines. Red are the 5v TTL lines. It's not pretty, but it works. Just jam those wires into a breadboard. Well, this year, I decided that I wanted to upgrade this a little, and make it slightly less hackey. I found an old power switching box I had resuced from a DIGITAL VAX in the early 90s. It has 8 outlets on the back, a nice metal chassis that is easily opened, and lots of space for the SSRs. First thing I did was gut it. I had gutted it many years ago, and turned it essentially into a glorified power strip. This time, I started mounting the SSRs inside the chassis. Lots of nice screw holes for mounting! It's going to be nice to have all of the 110V enclosed. All of the TTL level coming out through holes in the chassis. There should be rubber grommets there, but this is temporary, until I build a better connection system. This should work nicely for this year's office lighting decoration, not to mention that it's oodles safer, much more portable, and a lot less fragile! I'll hopefully be driving this with the electronics/protocol/sequencer system that I'm working on for the Animatronic Avian project, as a sort of stepping stone. Not to mention that this can be used to control lighting for the final birds too!